On the afternoon of February 26, Xinhua Net and CAICT signed a strategic cooperation agreement. The two sides will make full use of their advantages and jointly build a 5G new media lab, and explore a new mode of cross-border cooperation between the ICT and the media in 5G era, promoting the deep integration between the new ICT technologies, such as 5G, IoT, big data, AI, and the media. With the upcoming 5G era, new breakthroughs and highlights are emerging from upstream chip companies, intermediate equipment manufacturers and downstream applications. The rapid development and maturity of 5G industry chain will not only promote the transformation and upgrading of traditional industries, but also give birth to a number of new formats and modes. The 5G technology has become a new engine that will lead the future of information dissemination. Mr. Tian Shubin, Chairman and President of Xinhua Net, said that Xinhua Net has been actively exploring the application of cutting-edge technologies in the field of information dissemination and accelerating the construction of new mainstream network media. Its key businesses, such as big data, UAV, VR, AI and IoT traceability etc., will witness explosive growth in the upcoming 5G era. At the crucial moment of information dissemination revolution, Xinhua Net and CAICT will take the opportunity of signing strategic cooperation agreement to deepen cooperation, explore 5G applications in media, strengthen the driving force enabled by technological innovations, and jointly promote the further development of media convergence. Ms. Liu Duo, President of CAICT, said that as a high-end professional think tank and industrial innovative development platform of China, CAICT has played a strong supporting role in major strategies, planning, policies, standardization and testing as well as certification of industrial development, and has been very much involved in R&D of 4G/5G, industrial Internet, mobile Internet, IoT, big data and AI. 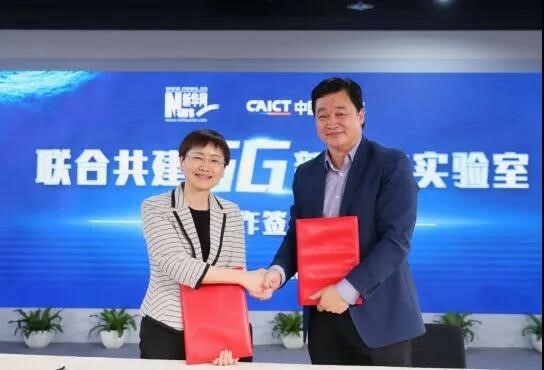 CAICT will work closely with Xinhua Net to make 5G new media lab more practical and creative, promote 5G application innovation, and boost the development of mainstream media, making greater contribution to the strategy of cyber power.